Listen Up, Theaters: If You Want Atticus Finch, It’s Sorkin’s Version or NothingTheaters must use Sorkin’s script. Aaron Sorkin Says Producer Scott Rudin Bugging Him About Social Network SequelA lot’s gone down since 2010. My Near-Impossible Job: Adapting To Kill a MockingbirdAaron Sorkin on the many challenges of bringing one of America’s most sacred novels to the Broadway stage. Every Episode of Sports Night, RankedAaron Sorkin’s first TV show turns 20. Harper Lee Estate Settles Legal Battle Over Sorkin’s To Kill a Mockingbird PlayScott Rudin has made peace with the Lee estate over the Aaron Sorkin–scripted production. Mockingbird Producer Offers to Stage Play in Courtroom Following New LawsuitThe author’s estate sued Aaron Sorkin’s upcoming stage version of her classic novel, saying the play’s Atticus Finch veers from the source material. Jeff Daniels to Explain Things in Aaron Sorkin’s Broadway To Kill a MockingbirdThe play’s performances begin November 1. The 6 Most Aaron Sorkin-y Things About Molly’s GameFrom the fast talking to the daddy issues. Sequins and a Push-up Bra: How Jessica Chastain Became Molly BloomThe costume designer behind Molly’s Game breaks down the real-life heroine’s best looks. Aaron Sorkin Dreams of Sterling K. Brown As President in West Wing RebootHe has standing offer for a reboot at NBC. Why Is Great Screenplay Writing So Hard to Judge?If directors are always heroes and writers are always hacks, how is it possible to figure out if a script is good? How Aaron Sorkin’s To Kill a Mockingbird Will Surprise YouWill Scout speak Sorkin? Aaron Sorkin’s To Kill a Mockingbird Is Coming to Broadway Next DecemberProducer Scott Rudin acquired the stage rights in 2016. Michael Lewis Says Hollywood Won’t Adapt Flash Boys Because It Has an Asian LeadThe nonfiction best seller is about Bradley Katsuyama, a real person of Asian descent. Aaron Sorkin on 30 Minutes at 1 Oak: ‘I Just Needed to See What Went on There’Molly’s Game has two club scenes, apparently. Amazon Scoops Cate Blanchett Lucille Ball Biopic Off the Conveyor Belt[Extremely Carol voice] Vitameatavegamin. Alec Baldwin to Star in Aaron Sorkin’s Live Adaptation of A Few Good Men on NBCThe televised drama will air sometime in 2018. Aaron Sorkin to Teach Online Screenwriting ClassIt’s part of the MasterClass program. Five-Card Stud Idris Elba Joins Aaron Sorkin’s Poker MovieHe’ll play the defense lawyer. Aaron Sorkin Is Bringing A Few Good Men to NBCHe’s writing and executive producing the new adaptation. Ted Cruz Quoted The American PresidentWhat is fiction? Showtime’s The Circus Chases a Sorkinized View of the 2016 ElectionIt capitalizes on the most appealing aspect of many of Sorkin’s TV series: the enormous boundaries between the public persona and the real self. Chastain in Talks for Aaron Sorkin’s Poker MovieChastain has been offered the lead role of waitress turned poker magnate Molly Bloom. 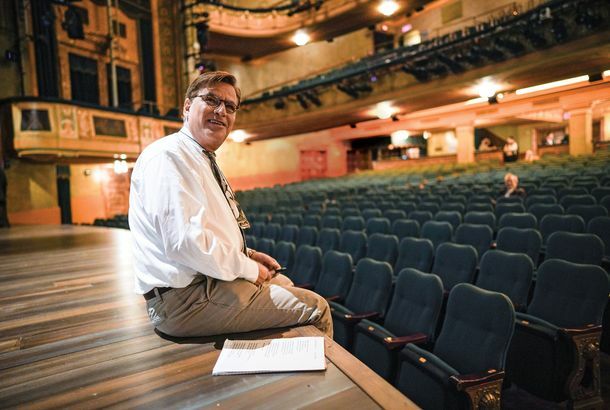 Aaron Sorkin Adapting Mockingbird for BroadwayTo be directed by The King and I’s Bartlett Sher. Aaron Sorkin Is Directing a Poker MovieSet in the infamous Hollywood poker ring. Just How Bankable Is Aaron Sorkin at the Box Office?He makes high-profile movies, but does he make money? FBI Drew Guns on West Wing’s Bradley WhitfordAaron Sorkin and Bradley Whitford were on The Late Late Show together. Steve Jobs Starts With Big Ambition, But Settles for Small DramaThe first act is a thing of beauty and the second, good enough. Shame about that third act, though. Aaron Sorkin Reunites With West Wingers, Sort OfWe willed it into existence with — but of course — a walk-and-talk. Aaron Sorkin Apologizes for Burning Tim Cook Over Apple’s Factory ConditionsAnd the children working in those factories all sigh with disappointment. Aaron Sorkin Blasts Tim Cook for Calling Him ‘Opportunistic’Someone call Apple Care! See a New Trailer for Sorkin’s Steve Jobs BiopicMmm, Jobs-y. Cate Blanchett to Play Lucille Ball for SorkinWhat a match.